RAISEup Texas has the potential to transform many tens of thousands of lives across the state and country, starting with 16 expansion sites in the Central Texas region – enough schools with high concentrations of struggling learners to demonstrate a tipping point of true population-level impact. But it will take a community committed to undertaking transformational change at scale. How can you help? To build a broad and deep evidence base that can lead to permanent, sustained public funding, we are asking private investors to support the first 16 expansion schools with a total investment of $3.4M – 100% of funding for the planning year which then diminishes over time as districts transfer funds from less productive programs until the sustained effort is fully funded by school districts. 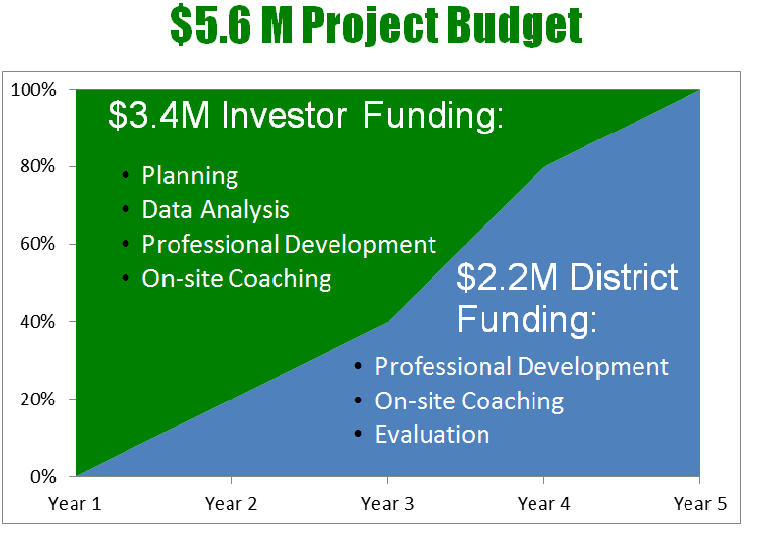 The total project budget of $5.6M over five years costs just $200 per student to implement.